Peter Rhodes: like the Murphy’s, not bitter at all. Honest. Some experiences are habit-forming, but not entirely enjoyable. The urge to repeat them occurs due to some Pavlovian desire for regularity, to give life a regular metre. So it is with reading the nightly column in the Express & Star by Peter Rhodes; I do it every day, although the experience is not unlike repeatedly hitting myself over the head with a housebrick; the enjoyment generally comes when the activity ceases. Peter can occasionally demonstrate a killer wit and sharp incision, but mainly recycles pre-owned opinions and email lore from t’internet, the middlebrow tabloids or his local boozer. I noted with some amusement this evening that the redoubtable Mr. Rhodes chose to have a pop at us pale imitators out on the inter-webs who clearly cannot be relied upon to produce journalism with integrity, social concern or credibility. You wound us, Sir... no, you really do. I would respectfully suggest that Peter take a peek over at the likes of mySociety.org where he will find citizen journalists (without the snide quotes, if you please) and other interested parties engaged in all manner of public spirited stuff, which will undoubtedly surface later in hundreds of blogs, campaign sites and news aggregators that make up the modern free press in this country. Just like the old press Mr. Rhodes so unfortunately represents, there are a good deal of nutters, loons and charlatans, but also no shortage of principled, high-quality writers and commentators who are doing stirling work and deserve to be heard. It’s quite unfortunate to see once again a rather unseemly dig at new media from a local institution that’s not above raiding and monitoring the ‘new generation’ for easy or topical copy. I find the fact that the Express & Star has recently featured articles about FixMyStreet (a mySociety project), local councillors on Twitter, Twitter for Oldies as well as regurgitating news often broken first on blogs quite ironic; for someone who so disrespects the trend towards DIY he seems to be working for the wrong newspaper. I think that if Peter Rhodes were to delve deeper into the matter then he might be surprised to find that the papers he defends are not the beacons of probity that he would have us believe. 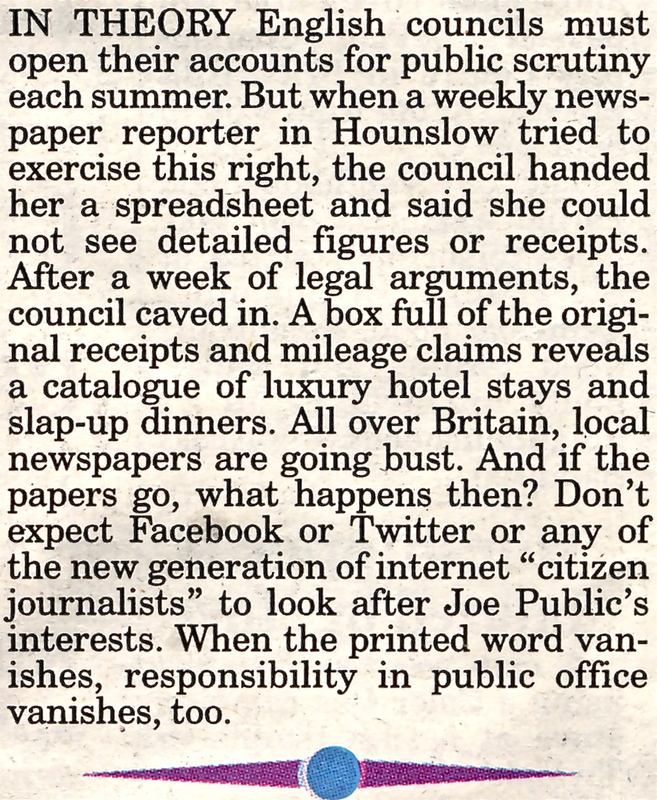 Rather, the local rags and the printed news in general are going bust in droves because the new media he so derides has outed them as the flabby, complacent, comfy bastions of poor research, lazy copy and me-too opinion that they actually are. Anyway, Peter, isn’t it about time you recycled those old exam howlers again? I love them more and more every time I read them. Same time tomorrow? It’s a deal! This entry was posted in Express & Star, It makes me mad!, Local media, Shared media and tagged blogs, citizen journalism, Express & Star, local blogs, old media, Peter Rhodes, printed media, Silly. Bookmark the permalink. 7 Responses to Peter Rhodes: like the Murphy’s, not bitter at all. Honest. I’ve read Peter Rhodes’ column, (and it’s predecessor- was that Gerry Anderson, or am I confused?) and I have to admit that over the years it has become less entertaining for me- Peter does indeed have a sharp wit, but some of the running jokes continue until they crawl. Anyway, regarding blogs, amateurs and new media. Guess how much I care what he things? My blog is, basically, a load of old tat I type into a computer. Funny that. 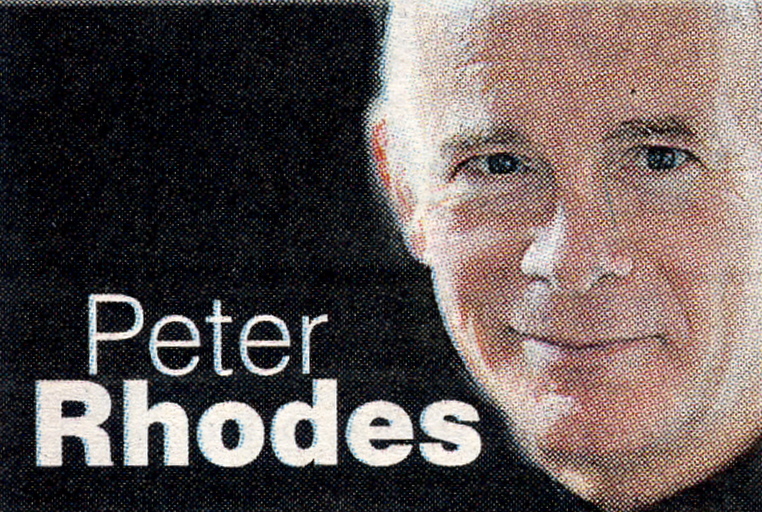 Yes, Peter Rhodes is very much the sorcerer’s apprentice to Gerry Anderson’s wizard. Gerry was a genuine wit and a very skilled journalist. I still chuckle about the Bilston Buffaloes. Peter seems to have declined in recent years. There’s less and less original stuff and more and more old jokes, recycled internet samizdat and sub-Littlejohn trolling for reaction. I think everyone who starts a blog hopes someone will read it – after all, shouting in the dark is not a gratifying experience. To paraphrase, I’m not trying to change the world but it’d be nice if I made the occasional reader look at things differently once in a while. Awesome stuff. I live in DC and found Peter Rhodes’ columns from a friend who lives in Walsall. Like you, every instinct tells me NOT to read his column but I cannot resist. I suppose I am a glutton for punishment and will continue to read his articles. I’m glad I found your blog because i want to get some insight into life in Black Country. The Express and Star barely scratches the surface (hey, it’s a newspaper, why would it?) so perhaps your blog will give me the info I desire, everyday life in the area. Thanks.